Heads are going to roll - lots of them - and you want to earn top bragging rights back in the guillotine operator's locker room. If you behead Marie Antoinette or King Louis XVI, everyone will be impressed, but who's going to care if you lop off a palace guard's head? So make sure that you collect the most prestigious noggins, and you'll be head and shoulders above the rest! I was first introduced to this game ages ago while we were waiting for people to show up for a dnd session. I remembered liking it a lot, so when I was getting a game night group together, I knew this would be a great thing to open with. As the name suggest, this game is about pleasing bloodthirsty crowds by offing obnoxious aristocrats. This is essentially a line management game. You’ve got ten or twelve head cards depicting various nobles and religious figures queuing to a guillotine, and you spend your turn manipulating the line with an action card to get the noble you want. You only get one action per turn and typically collect one head. Some of them are obviously worth more points than others (King Louis is more of a crowd pleaser than your average palace guard) and some are worth negative points (no one wants to see the martyrs or the hero of the people get beheaded). When you run out of people in line, you start a new batch and a new “day” begins. When the third day is over, the game is over and everyone counts up their points. The one with the most points wins. Its a pretty simple game. There isn’t any room for serious strategy, but its simple enough that you can explain the rules to newbies in about five minutes and get playing. I also find that it is enjoyable with any number of players. I don’t care for the box. Its small, which I guess makes it okay for traveling, but getting the cards back into the box is a hassle. Its also too skinny for if you try to keep all the cards in each deck together. If i didn’t like the executioner standee thing as much as I do, I’d just get card boxes. Aside from that, its a cute game. It looks like a Milton Bradley game with a comically twisted theme! I’m not sure if this is necessarily a game I’d introduce very young children to, but the bizarre executioners-in-the-French-Revolution theme is pretty well nerfed, so it should be good for a variety of groups of people. I recommend having this game on hand for intro games for new groups and for down time. Its got enough replay value for that, but it might get a bit old if you play it repeatedly in a single session. Overall, its a handy game that has stood the test of time very well! Sometimes a simple game is all you need for a good time. The rules of Guillotine are quite basic. You can learn the game rules or show them to someone else in a few moments. This helps make Guillotine a very approachable game, but what makes it keep getting played is just how fun it is. You are an executioner, You cut off heads, and being good at your job is important. Collect better heads at the end of three days, and you can be the best darn executioner in the kingdom. Well…until the next game anyway. The game has a line of cards. They are the heads you are trying to acquire for points. The point of the game is to move the line around so the cards you take are better than the cards your opponents take. You always take the head on the right side of the line, but cards allow you to move the order of this line. Some of the heads give extra bonuses, some are just straight up points, and some are going to cost you points and make you look like an executioner in training which is quite embarrassing indeed. There is a lot of variation in the types of cards you can play. Everything from changing the way certain heads contribute points to removing all the heads and getting an entire new line of victims. For a simple game, you can have a good amount of strategy. You can also play this game as a lightning fast point collecting game. Both are fun and both are available with this game quite easily. The cards are well illustrated, they are humorous, and the game flows very well and very quick. The theme may be of beheading, but it is with a tongue in cheek approach. This is Saturday morning cartoons executions we are talking about here. -Even though there is a good mix of card abilities, there could have easily been more. -The game can go by faster than you might hope for. Play another game, or make house rules to lengthen the game, otherwise it goes by pretty fast. Guillotine is fun. Simple as that. It’s not complex, but it doesn’t set out to be. There are some interesting strategies with the cards, but those are limited as well. As long as your not dead set against simple games, it’s hard not to have fun with this. It’s very affordable and bound to be played again and again. You are trying to bribe or convince the executioner to chop the heads off the people you feel are most deserving, or to save those people you feel shouldn’t be executed. You are trying to bribe and convince the King’s Guard to let in the people you feel are most deserving, or to prevent access to those people you feel shouldn’t be allowed to see the King. Either way, the game is played the same. There are a few cards that might seem strange with the Unofficial theme, but kids are going to see funny cartoon faces, not the gaps in logic. The game is divided into three days. Each day has a line of 12 Nobles in line, and ends when those Nobles are gone. After the third day, the game ends and you add up the total number of points you got for Nobles you got to the front of the line on your turn. 1. You MAY play a card from your hand. You don’t have to play a card, but you’re probably going to have a good card to play even if you don’t want to change the order of the line. 2. You MUST take the card at the front of the line. This is mandatory. The executioner takes a head (or the Guard ushers in the next person to see the King) on each player’s turn. You want the most valuable person to be taken on YOUR turn so you can be the most influential advisor to the King. 3. You MUST draw a card. You’ll be craving cards, because the cards are what allow you to make the strategic choices. This is a great pickup game for when you’re sitting around wondering what to do for 20-30 minutes. It’s also great when you have a mix of gamers and non-gamers. I’ve met very few people who didn’t enjoy playing a game of Guillotine. This isn’t going to be everyone’s favorite game, but I don’t know anybody who “hates” it. This is one of those games that is always in my bag when I go somewhere else for gaming. In this light card game, players take turns collecting heads from the guillotine during the French Revolution. There are two decks: the noble deck, and the action deck. There’s also a little model cardboard guillotine with an executioner standing next to it. You set up the cardboard (doesn’t do anything, but it’s funny) and deal a row of twelve nobles for that day’s slate of executions. Different nobles have different values – King Louis is worth 5 points; the P i ss Boy is only worth 1 – and some of them trigger effects. Players take turns using action cards from their hands to try to get the most valuable collection of nobles into their own stash. When the row of twelve is gone, deal another twelve for the second day. After the third day of twelve, the game is over. Cards from the action deck and the nobles themselves can affect the value and the order of the nobles in line, and play moves *very* fast. The Guillotine page on the boardgaming.com website gives a decent idea of what the art in this game is like. It is *extremely* light and silly. There is no gore. There are images of blood, but they are so cartoonish it is silly. I play with my 8 year old girl and she *loves* it, I think because the art is so entertaining. She isn’t normally a game player. Neither, for that matter, is my aunt in New York, and she loves this game too. So do my various game-playing relatives. It’s light, fast, and family friendly. Gamers looking for a filler game (~20 – 30 minutes.). Gamers who play with non-gaming kids. Gamers who play with non-gamers. Gamers who need something deep. Gamers who have no patience for cartoonish art. Ahh, Guillotine, the family game that features excellent art very similar to Walt Disney’s Beauty and the Beast, easy to learn game play and a subject matter that is rather gruesome if you stop to think about it, and yet not really much different than playing games like Modern Warfare, Call of Duty or any other game that borrows from the real world’s darker side. If black comedy had a card game, this would be it! The setup is that you’re knee deep in the French Revolution, possibly even the Reign of Terror all things considered. Nobles, soldiers, clergy, royalty and martyrs are lined up as if it was Studio 54 circa 1977. The difference here is, this is the one line none of them wants to be on! Each “day” (ie, a game round) 12 new figures are lined up and one by one they march towards the National Razor to lose their heads. It’s your job to collect those heads over a “3 day span” for points! The more powerful the figure, the more points their head is worth! Louie XVI and Marie Antoinette are both valued the highest, but you can rack up a bunch of points with others by playing cards from your hand that give bonuses. The art for the game is fantastic, especially if you’re into animation style art work. The art is so close to Beauty and the Beast that you could seamlessly slip The Beast, Belle and Gaston in and they could easily be believed to be part of the game. The cast of characters ranges from actual figures such as King Louis XVI, Marie Antoinette and Robespierre to colorful roles and archetypes like the **** Boy and the Lady In Waiting. As for the game play, players play cards from hand like “Rain Delay”, “Clerical Error”, “Bribed Guards”, etc to manipulate the execution line so that the valuable heads will arrive at the headsman when it’s their turn. After the 3rd day, all players tally their point totals and the one with the highest total wins the game. The game plays quickly and is a great diversionary game to play in between other longer games, play in hotel rooms, on road trips and on family game nights. This is a fun, quick game that is easy to learn and is easy to travel with. I highly recommend this game for your game bag/backpack/glove compartment! Now go grab an extra wheel barrel and start collecting! Okay no. This is not a game about Alice in Wonderland and the Queen of Hearts. 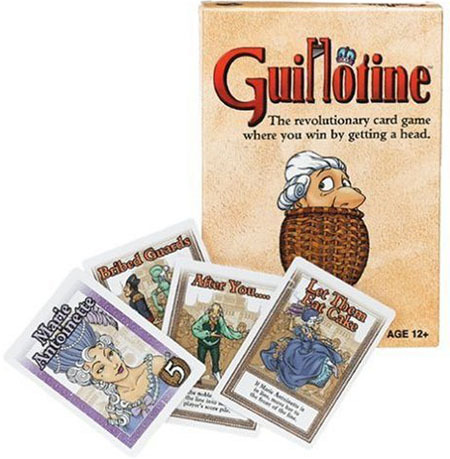 Guillotine takes place during the French Revolution and the players are each executioners trying to get the most precious heads of the people in line at the guillotine. So let’s keep our heads down and see how this game works. The Game comes in a little cardboard box and contains a rulebook, 110 cards (50 Noble cards, 60 Action cards) of good quality and a cardboard guillotine. After shuffling the Noble Deck and the Action Deck place the guillotine on the table and then draw 12 cards from the noble deck. These cards or persons get lined up in front of the guillotine. Then each player gets 5 cards of the Action Deck into their hands. One random player goes first and can play one action card and then beheads the first Character in the line to earn points. The action cards may manipulate the order in the line to get better and more valuable characters to the front. At the end of the turn the current player draws a Action card and the next one starts his turn. When there are no nobles left in the line the day is over and day two begins with 12 new nobles in the line to be executed. This goes on for three days and then the players compare their points to define who is the winner and therefore the best executioner of all. I played it a few times now and still have fun doing it. For a short game here and there this game is eminently suitable. But I can imagine that it could get boring when you play it to often. First: I like dark and grim humor and think the theme is funny. To be an executioner and try to manipulate the line of convicts to pick the valuable ones = much fun. Gaming experiences have become more complicated in recent years, and a good number of games require a fair amount of startup time and cleanup time besides the actual time required to play the game itself. It’s no wonder that many games span well past an hour to play, which makes getting together for a gaming night with friends a real investment into the evening. But the thing about complicated games is that they give a sense of depth and feel to them; the good ones can become really involved, to a point where a game feels less like a game and more like an experience. The problem with the long games, however, is that they can become exhausting, and when a group is pressed for time, they can usually only plan one or two games a night. This is where games like Guillotine really shine; a game of Guillotine can be very quick in comparison to other games, and works well as a filler or as a stand-alone game to play with friends. So what is Guillotine about? Well, in a nutshell, it is the days of Marie Antoinette, and the populace is in an uproar. They have had enough, and the peasants are calling for blood…specifically, the nobles’ blood. And anyone else who was unfortunate enough to get caught in the mob’s path. The game is set over a course of three days, in which players will attempt to collect the most points by collecting nobles into their score pile (in reality, those nobles are getting beheaded by the executioner who waits at the chopping block for the next victim, but if you want to avoid the grim setting, one can just rephrase things to say that you’re saving the nobles instead). During the days in which the game is set, a line of cards representing nobles is set out in front of a cardboard executioner (I believe 12 nobles in all for each day). The noble at the head of the line will be the first to be executed, followed by the noble behind him or her, and so on, and so forth, until all the nobles have been executed. Each noble has an associated point value that goes along with it, ranging from 5 at the high end, to -3 at the low end (Hero of the People…the mob doesn’t want to see him executed, but oh well). During each player’s turn, that player MUST collect a noble from the line, almost always from the front of the line. Of course, some nobles are more desirable than others, and no one wants to take that -3 hit to their score. To assist the players in maneuvering the line to the chopping block in a way that favors them, players make use of the action cards. Each player receives 5 action cards at the start of the game, and during each of their turns, that player may elect to play one action card from their hand. There are many different types of action cards; most affect the order of nobles in some way, like moving a noble back two spaces in line, or rearranging the first 5 nobles in line randomly. Others affect point scoring, like an action card that gives one additional point for each red noble you have in your scoring pile at the end of the game. Still others can attack other players, like swapping action hands, or stealing a noble from their score pile. An effectively played action card can sometimes swing a game drastically; Double Feature, for instance, allows you to collect two nobles from the front of the line instead of one. The nobles themselves are not simply just point values; they also sometimes have special abilities themselves. The Master Spy moves to the end of the line every time an action card is played, which usually ensures that he will be the last noble to be collected during a given day. The Clown gives a -1 to a point value, but the person who collects it can assign the Clown to someone else, making it an attack card. And then there are the Palace Guards, which value goes up for each one you have in your score pile. 1 Palace Guard = 1 point, 2 Palace Guards = 4 points (2 x 2 points each), 3 Palace Guards = 9 points (3 x 3 points each), and so on. At the end of three days, all players total up their score piles and any score modifier cards that they have, and come up with a final score; the player with the highest score is the winner. Really, there’s not much more to the game than that. Your average game of Guillotine from start to finish is roughly about a half-hour with 4 players, with slight time modifications with greater or lower numbers of players. The game’s learning curve is such that anyone can grasp how to play the game just by watching it, and the game itself requires minimal explanation and setup. The art of the game is whimsical and amusing, which makes playing the game entertaining rather than macabre. In its own element, Guillotine quickly becomes the go-to game to just pick up and play, and for this reason, I highly recommend picking it up. Guillotine is a lighthearted card game that can be played quickly, easily under 30 min. The mechanics are simple: collect the noble at the start of your line or rearrange the line to collect a different noble. The art work on the cards in my opinion is pretty funny, I even went as far as to paint the picture of the executioner and guillotine. Strangely the game offers an opportunity to tell my kids and the kids at my school’s board game club a little of the French Revolution. Pointing out who King Louie, Marie and Robespierre were. The action cards allow for a little nastiness against the other players by giving them negative points, not allowing them to rearrange the line or play action cards on their turn. I like that you can effect other people’s scores besides just improving your own. It is also nice that the game is over in three rounds (days) so it’s a great filler game or a game you can play multiple times. Not a game we play on a regular basis but we will go to in spurts when we want a change of pace from the more involved games we usually play. As has been said elsewhere, the theme for Guillotine is pretty grim, being based on the near-industrial scale slaughter of nobles (and anyone else inconveniently in the way of the regime) during the French Reign of Terror. This game makes light of the situation in a way not unlike the film Carry On Don’t Lose Your Head (though not as full of dire puns), and I rather like it. I won’t, however, be playing this with my daughter in the near future. The mechanics are simple: line up a load of noble cards (which all have nicely executed comic-style artwork), then each player has the chance to play an action card, then executes the noble at the front of the queue. You score points for nobles you execute; some have negative scores, and some have special effects like preventing you playing an action card or being scored in a non-standard way. Action cards mostly allow you to make changes to the order of the queue, but some provide bonus or penalty scores or have more exotic effects like swapping hands with another player. This isn’t a game to worry too much about strategy, but there are some things to look out for and the possibility of some fairly clever plays to improve your lot. I’d class this as a lightweight filler game that is not completely trivial. All in all I really enjoy Guillotine. You’ll have to make your own mind up about the theme, but the mechanics fit the theme well and make for a fun, fast-moving game. There are a number of reviews that talk about how to play this game. There are a number of reviews that talk about the theme of this game. There are a couple of reviews that left me shaking my head because they said one thing then came back later countermanding what was said earlier. So, what more can be added that hasn’t already been mentioned? This game is hilarious. It is tongue-in-cheek. It doesn’t take itself seriously. And, while it is built on gallows humor, it never reaches the point of crossing any lines of societal decency. However, with that said, I can understand where some might find the theme of chopping off the heads of nobles could be less than savory. I can understand how parents of younger children (5, 6, 7) might be reticent about that theme. So….turn it into a noble’s party. You’re inviting nobles to your castle for a party, but you only want the best, most influential nobles to attend. Remove the cartoon guillotine and change the theme. Simple as that. The artwork is fun, conveying the sense of whimsy that is supposed to be the underpinning of the game. The game play is fast. This is a filler game; something to bring out at the start of the evening or to end an evening of gaming. It never fails to get people laughing, talking and groaning as that higher point noble goes to someone else, or when someone thinks they have a winning move only to be cut off by someone who changes the card order. Highly recommended for a light, whimsy-filled time. Disclaimer, the title is not original, in fact, that is the games tagline. I’m not very creative. I gave this game a 10/10 and it is merited. Mind you, I am a little biased as this was the first ‘more advanced’ game that I fell in love with. 4/5 Replay Value: From my experience, Guillotine appeals to most people, and can be played numerous times (maybe a little redundant if played time-after-time). The randomness in the line-up makes each game unique, and the cards in your hand will uniquely influence the line. As a result, game-to-game strategy should vary slightly. 4/5 Components: Card are cards, so not much can be said there, but the pop-up executioner is a nice touch. Also, the art direction of the characters is nice and charicaturized, which is important since the game is a little morbid. Surprisingly, some of the cards have important historical accuracy (like Robespierre’s special ability). Guillotine is a super fun game, but it might get a little redundant after a while. If you do manage to add it to your game library, I’m sure you’ll be putting it to use every now and again. It deserves a spot on your shelves, and you might even get a fun history lesson in the process! Guillotine is a fun game. Don’t expect anything more and you’ll have fun too. Each turn players may play a card and have to behead a noble in the line to the guillotine. However, when you play with three or more, strategic thinking does not really work anymore. By the time it’s your turn, the guillotine may have been switched to the other side and the order of the line may have changed completely. So just focus on getting the most points in your own turn and just have genuine fun when someone’s plans are completely foiled. I think that the probability of winning is 1 divided by the number of players, so don’t pick it up if you expect a grand strategy game. And to quote Highlander: Don’t lose your head! Looking at its mechanics Guillotine is quite an interesting game. I could describe it as a “Queue management game”. There are two decks there. The first contains cards that form the queue on the table. Basically players take cards from this deck one after another in sequence. These cards bring victory points. The cards from second deck are kept in players’ hands. The players may use them to alter the order of the queue to get themselves the most valuable cards from there leaving the less valuable ones (including ones with penalties) to the opponents. The theme chosen for the game is – in my opinion – unacceptable. Players are executioners. Yuck. More! Not only plain executioners but ones during the French revolution, during times when to be sentenced to death it was often enough to be born as a noble. The executions were commonly just justified murders that time. Yeah, it was long time ago. But it does not change much. If we accept such a theme for a game next generation could accept as normal, let’s say, a game about genocide management in a Nazi German concentration camp during the second World War (there is one, really). Summing up: the nice mechanics of this game should be re-implemented with a more proper theme. In its current form I recommend not to play it, and most of all not showing it to any children. This is one of the easiest games to learn and teach I have in my collection. The theme is grim but the Action cards provide the humor to get you past it. There’s enough “take that” and escape cards to keep the games fun. I have played 3, 4 and 5 players and we always have a blast. Scores have ranged from 30 to -1. The -1 player won the previous game and we all agreed to troll him. It takes up alittle room, so it doesn’t replace Love Letter as the “play while we wait for our food” game, but it’s short length makes it a favorite of my group right now. This is a great game to break the ice and start the evening. It’s very easy for newcomers to learn in just a few minutes. It involves just enough strategy to warm up your think muscles. I find myself continually looking at the art, which is extremely well done. The different expressions of the nobles are hilarious. I’ve seen some harsh reviews of the theme, but there’s no blood or gore depicted on any of the cards. Quite benign actually. We never get tired of this one as a filler game. This is a fantastic game to get other people into something besides the typical trappings of Monopoly, Trivial Pursuit, etc. I have taken this to family game nights and everyone had a good time. It was easy enough to teach to family members unfamiliar with games of this genre before and “strategically complex” enough to keep those who were familiar with games like this interested. If you like games that are fun and quick, this is a great example of both. The theme of the game is a bit odd, especially if you have small children, but otherwise it’s very fun. “Did you bring Guillotine?” whenever I come by for a visit. What more need I say? Try it – you’ll like it. Add a Review for "Guillotine"